"Is there truly a new mode of transport - a fifth mode after planes, trains, cars and boats?" Elon Musk, the founder of Paypal, SpaceX and Tesla Motors, believes the answer is yes - and he's not talking about the Segway. The serial entrepreneur has released his plans for The Hyperloop - an idea for a radical new mass transit system that involves whizzing around in tubes on a cushion of air. If you're thinking that sounds like something out of a sci-fi novel, you'd be right. But Musk believes it could be made reality, linking Los Angeles with San Francisco for as little as six billion dollars. There are several things that a new mass transit system would need to do, Musk says. It needs to be safe, fast, low-cost, convenient for users, immune to weather and earthquakes, self-powering and cause low disruption to the area along that route. In a blog post and accompanying PDF, Musk lays out the details of his proposed solution. He imagines a pair of 350-mile tubes (one in each direction) with much of the air inside pumped out to reduce drag on the capsules that travel down it. To meet his criteria, Musk proposes tubes positioned next to major highways, suspended above the ground on pylons. For simplicity, they would be constructed in prefabricated sections that are simply dropped in place and welded together, in the same way that China is currently constructing the world's tallest building. The enclosed tubes would make it safe and weather resistant, and telescoping sections would handle the earthquake risk. The top would be covered with solar panels, which would supposedly generate power "far in excess of the energy needed to operate". A full vacuum in the tubes, Musk says, would be impossible to maintain, but he says there's a sweet spot between air resistance and the level of leakage that standard commercial pumps can overcome that makes the system viable. One problem is the "Kantrowitz Limit" - a point at which the capsule starts pushing around what little air there is inside the tube, like a syringe. Musk believes this can be overcome with a high-powered fan that transfers high-pressure air from the front to the rear of the capsule. The capsules themselves would float on a cushion of air, a bit like an air hockey table. "Wheels don't work very well at that sort of speed, but air bearings have been demonstrated to work at speeds of Mach 1.1 with very low friction," Musk says. This cushion would be generated by the pod itself with high-powered fans. In fact, most of the technology would be housed in the pod itself to keep costs down and the tubes simple. It would be propelled by a linear electric motor, like the one in a railgun, which would accelerate the pod to high subsonic velocity and give it an extra boost every 70 miles or so. At the end of the line, it slows the pod down again to a gentle stop. 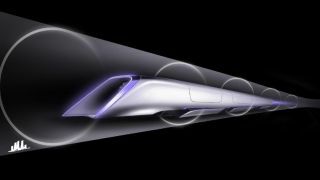 To ride the Hyperloop, passengers would drive their car into a capsule and then just sit and wait until they arrive at their destination. In a conference call, Musk said that passengers would experience slightly more than the force of gravity - but it would feel more like an aeroplane than a rollercoaster. A trip would last around 30 minutes with capsules departing every 30 seconds, and could cost as little as $20 (£13). Musk says the concept would work best for cities separated by less than 1,000 miles - above that, supersonic air travel makes more commercial sense. While Musk says he'd like to put a prototype together, he has no plans to do so for the time being, claiming to be too busy with his commercial space project SpaceX - which remains the only commercial space company that has docked with the International Space Station. That leaves the door open to others to put together a demonstration model which, he says, would take up to four years to complete. A commercial system would likely take as long again after that. So don't expect to be whizzing down tubes to visit your granny any time soon. But by the time you're a granny? Don't rule it out.